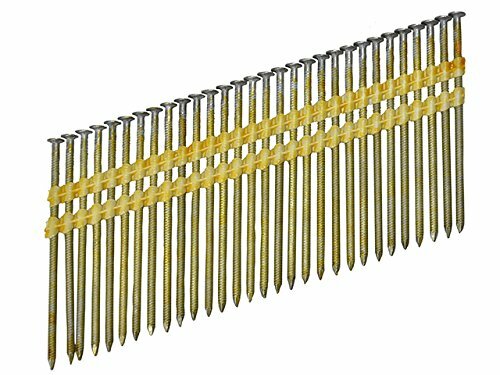 Packs of 2000 Round head nails.These plastic collated stick nails traditionally have a full round head, while only giving marginally better holding power to clipped head nails, they are preferred by the construction industry. Collation is angled at 21° to accommodate the overlapping heads.Smooth shank nails have exactly that: a smooth appearance. Due to their regular form they can be produced at very high speed and are therefore the most economical type of nail. However, their holding power is the lower than ring shank nails. They require less energy to drive them and the air consumption per nail can be lower. Sometimes it is possible to use a smaller tool to drive them.Ring shank nails have a series of rings punched into the surface of the shank. Again a difference in the diameter of the shank is produced making it even more difficult to withdraw the nail. Ring shank nails have to be produced at lower speeds and their cost is generally higher than for a smooth shank nail. The air consumption per nail is also higher, and the energy required to drive these nails into hard wood is very much greater.Bright finish is without any form of protection and is the most economical choice, but the nails will start to rust before nails that have a protective treatment. Used in applications where no protection is required, for example a one way disposal pallet. As all standard nails come with this finish.Galvanising , or coating with Zinc, is the best way to prevent nails from corroding. The zinc does not protect the steel of the nail, but is corroded first. The thicker the zinc coating, the longer it will be before the nail is attacked. The thickest coating is called hot dipped and is applied by dipping the nails into a bath of molten zinc. Galvanised protection is measured in Microns (each Micron is 0.000001 of an metre thick). The thicker the micron coating the better the protection level of the nails.